RIO DE JANEIRO, Apr 16 2014 (IPS) - Deforestation, especially in the Andean highlands of Bolivia and Peru, was the main driver of this year’s disastrous flooding in the Madeira river watershed in Bolivia’s Amazon rainforest and the drainage basin across the border, in Brazil. That is the assessment of Marc Dourojeanni, professor emeritus at the National Agrarian University in Lima, Peru. His analysis stands in contrast with the views of environmentalists and authorities in Bolivia, who blame the Jirau and Santo Antônio hydroelectric dams built over the border in Brazil for the unprecedented flooding that has plagued the northern Bolivian department or region of Beni. “That isn’t logical,” Dourojeanni told IPS. Citing the law of gravity and the topography, he pointed out that in this case Brazil would suffer the effects of what happens in Bolivia rather than the other way around – although he did not deny that the dams may have caused many other problems. The Madeira river (known as the Madera in Bolivia and Peru, which it also runs across) is the biggest tributary of the Amazon river, receiving in its turn water from four large rivers of over 1,000 km in length. The Madeira river’s watershed covers more than 900,000 square km – similar to the surface area of Venezuela and nearly twice the size of Spain. In Bolivia, which contains 80 percent of the watershed, two-thirds of the territory receives water that runs into the Madeira from more than 250 rivers, in the form of a funnel that drains into Brazil. To that vastness is added the steep gradient. Three of the Madeira’s biggest tributaries – the Beni, the Mamoré and the Madre de Dios, which rises in Peru – emerge in the Andes mountains, at 2,800 to 5,500 metres above sea level, and fall to less than 500 metres below sea level in Bolivia’s forested lowlands. These slopes “were covered by forest 1,000 years ago, but now they’re bare,” largely because of the fires set to clear land for subsistence agriculture, said Dourojeanni, an agronomist and forest engineer who was head of the Inter-American Development Bank’s environment division in the 1990s. The result: torrential flows of water that flood Bolivia’s lowlands before heading on to Brazil. A large part of the flatlands are floodplains even during times of normal rainfall. This year, 60 people died and 68,000 families were displaced by the flooding, in a repeat of similar tragedies caused by the El Niño and La Niña climate phenomena before the Brazilian dams were built. Deforestation on the slopes of the Andes between 500 metres above sea level and 3,800 metres above sea level – the tree line – is a huge problem in Bolivia and Peru. But it is not reflected in the official statistics, complained Dourojeanni, who is also the founder of the Peruvian Foundation for the Conservation of Nature, Pronaturaleza. 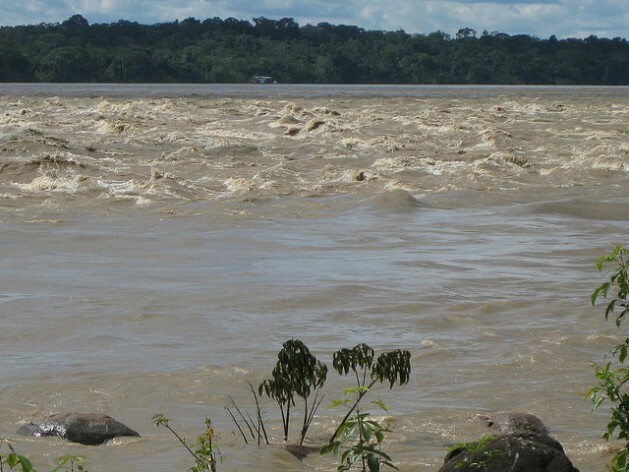 When the water does not run into barriers as it flows downhill, what happens is “a tsunami on land,” which in the first quarter of the year flooded six Bolivian departments and the Brazilian border state of Rondônia. The homes of more than 5,000 Brazilian families were flooded when the Madeira river overflowed its banks, especially in Porto Velho, the capital of Rondônia, the state where the two dams are being completed. BR-364 is a road across the rainforest that has been impassable since February, cutting off the neighbouring state of Acre by land and causing shortages in food and fuel supplies. Outbreaks of diseases like leptospirosis and cholera also claimed lives. The dams have been blamed, in Brazil as well. The federal courts ordered the companies building the hydropower plants to provide flood victims with support, such as adequate housing, among other measures. The companies will also have to carry out new studies on the impact of the dams, which are supposedly responsible for making the rivers overflow their banks more than normal. Although the capacity of the two hydroelectric plants was increased beyond what was initially planned, no new environmental impact studies were carried out. The companies and the authorities are trying to convince the angry local population that the flooding was not aggravated by the two dams, whose reservoirs were recently filled. Such intense rainfall “only happens every 500 years,” and with such an extensive watershed it is only natural for the plains to flood, as also occurred in nearly the entire territory of Bolivia, argued Victor Paranhos, president of the Energia Sustentável do Brasil (ESBR), the consortium that is building the Jirau dam, which is closest to the Bolivian border. The highest water level recorded in Porto Velho since the flow of the Madeira river started being monitored in 1967 was 17.52 metres in 1997, said Francisco de Assis Barbosa, the head of Brazil’s Geological Service in the state of Rondônia. But a new record was set in late March: 19.68 metres, in a “totally atypical” year, he told IPS. The counterpoint to the extremely heavy rainfall in the Madeira river basin was the severe drought in other parts of Brazil, which caused an energy crisis and water shortages in São Paulo. A mass of hot dry air stationed itself over south-central Brazil between December and March, blocking winds that carry moisture from the Amazon jungle, which meant the precipitation was concentrated in Bolivia and Peru. These events will tend to occur more frequently as a result of global climate change, according to climatologists. Deforestation affects the climate and exacerbates its effects. Converting a forest into grassland multiplies by a factor of 26.7 the quantity of water that runs into the rivers and increases soil erosion by a factor of 10.8, according to a 1989 study by Philip Fearnside with the National Institute for Research in the Amazon (INPA). That means half of the rain that falls on the grasslands goes directly into the rivers, aggravating flooding and sedimentation. The higher the vegetation and the deeper the roots, the less water runs off into the rivers, according to measurements by Fearnside on land with gradients of 20 percent in Ouro Preto D’Oeste, a municipality in Rondônia. And clearing land for crops is worse than creating grassland because it bares the soil, eliminating even the grass used to feed livestock that retains at least some water, Dourojeanni said. But grazing livestock compacts the soil and increases runoff, said Fearnside, a U.S.-born professor who has been researching the Amazon rainforest in Brazil since 1974. Bolivian hydrologist Jorge Molina at the Universidad Mayor de San Andrés, a university in La Paz, says the same thing. But Bolivia is among the 12 countries in the world with the highest deforestation rates, says a study by 15 research centres published by the journal Science in November 2013. The country lost just under 30,000 sq km of forest cover between 2000 and 2012, according to an analysis of satellite maps. Cattle ranching, one of the major drivers of deforestation, expanded mainly in Beni, which borders Rondônia. Some 290,000 head of cattle died in January and February, according to the local federation of cattle breeders. The excess water even threatened the efficient operation of the hydropower plants. The Santo Antônio dam was forced to close down temporarily in February. That explains Brazil’s interest in building additional dams upstream, “more to regulate the flow of the Madeira river than for the energy,” said Dourojeanni. Besides a projected Brazilian-Bolivian dam on the border, and the Cachuela Esperanza dam in the Beni lowlands, plans include a hydropower plant in Peru, on the remote Inambari river, a tributary of the Madre de Dios river, he said. But the plans for the Inambari dam and four other hydroelectric plants in Peru, to be built by Brazilian firms that won the concessions, were suspended in 2011 as a result of widespread protests. This man’s destruction and how many lives is it going to take before it is realized that deforestation is very damaging. These industrial companies don’t care as long as they make their money, fracking the land for the precious pipelines don’t care. Wake up people and say no, use your voices, get informed. Only you the people can stop all of this destruction before it is to late. Professor Marc Dourojeanni could be correct, but as scientists we must provide definite scientific evidence of the effects of deforestation in the runoff and floods in the basins in questions. Statements and perceptions alone cannot be used to categorically state that the so called “tsunami” was caused by the deforestation. It is logical, but it has to be proven. It is necessary to calibrate and run a rainfall-runoff model (such as HEC-RAS) to reach a conclusion that can withstand challenges in the scientific arena. The article does not describe any method or quatitative results that allow him to reach these conclusions. Yes! Consider that each additional gram of water in a cubic kilometer of air is equal to an additional 1000 tons of water. Combined with the fact that vapor pressure of water increases geometrically with temperature, the math tells a potentially very different story. It is closer to the reasoning of the INPA. The dry air in the east, is increasing temperature, thus increasing vapor pressure so much that the air may be carrying, I guess, 30 to 40% more water into the mountains. Although forest matrix would help to reduce the flooding, such excess would overwhelm that effect. 1000 km times 3 kph times 3 additional grams (10g at 30%) times 1bn m per km3 equals 216 million additional tons per day. That’s an extra 4 average Colorado Rivers without dams. It can easily be 6 or even 12 extra grams, so… Pluvinergy could resolve this with more advanced designs, but for now, we need to build lots and lots of dams. Sorry, I know this is hurtful, but we have messed up the planet beyond simple mitigation. PS: it is not caused by the dams, at all, becasue evapotranspiration is much greater than surface evaporation into a humid environment.